I touched on it a little this week, but it's official - my mother in law has booked her trip out for the end of April and we are going to knock out a finished laundry room. 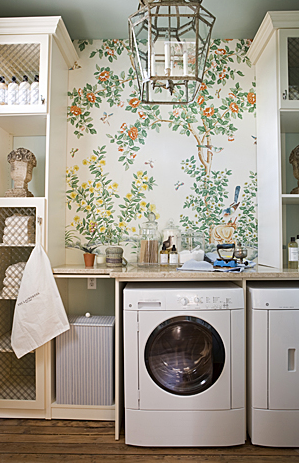 So it's time to do some research and check out some laundry room inspiration. I definitely want a countertop above our washer/dryer... but granite is too rich for our blood. I'm thinking butcher block? This one is titled "i wish"..
Like kid's rooms, I think you can go "fun" in a laundry room with color and pattern. There is not much room in our laundry room to put any fabric.. but I can see doing a really fun rug. I was really surprised when she posted her reveal because I had planned the exact same hook treatment in our laundry room, too! We air dry a lot of our clothes, so a lot of hooks are necessary. It will be fun to see how ours turns out (our room is a lot smaller so I'll need to go with smaller hooks so they don't reach out and get anyone). Practically speaking, I've wondered how well the countertops work on top of the washer and dryer. My front loader vibrates so terribly that I worry it would knock out the cabinet walls and/or countertop! I love the simplicity of the last pics. The top with the subway tile, the SS, the granit, the containers... Kinda too much going on Ikea has really great wood counter-tops. Perfectly acceptable for this room. Look for remnants too! You could get away with a nick or blemish if it meant a great deal right? Check Sears for butcher block counter tops! We got two 6 foot sections for around $130 each last year. So lucky to have a laundry room! I wish ! Can't wait to see what you come up with, I'm a big fan. 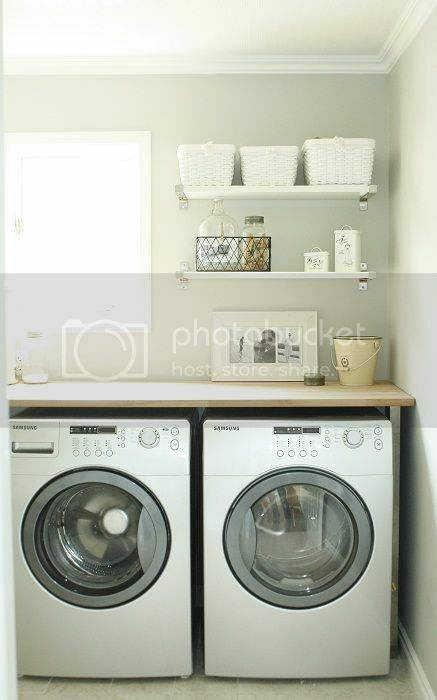 Making over my laundry room is on my to-do list. These photos are super inspriational. Thanks for sharing them. 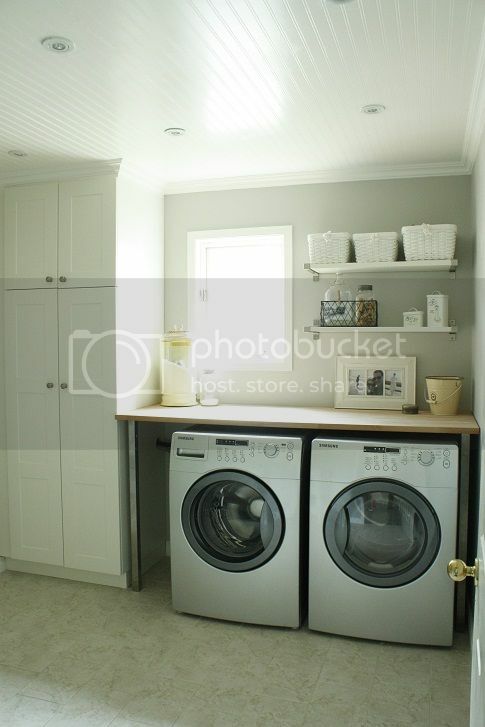 I daydream of having a decent laundry room. Right now our laundry machines are in a corner of our unfinished basement. There's talk of actually finishing it, but who knows when that will be. 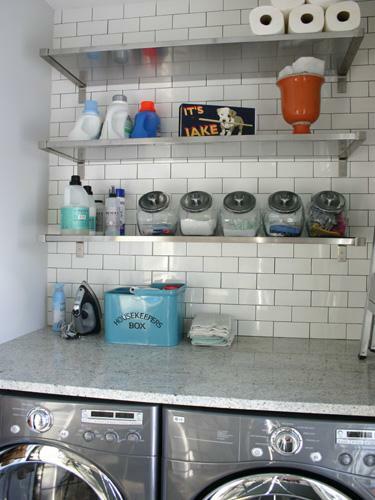 I have those stainless shelves from Ikea in my kitchen and love them. 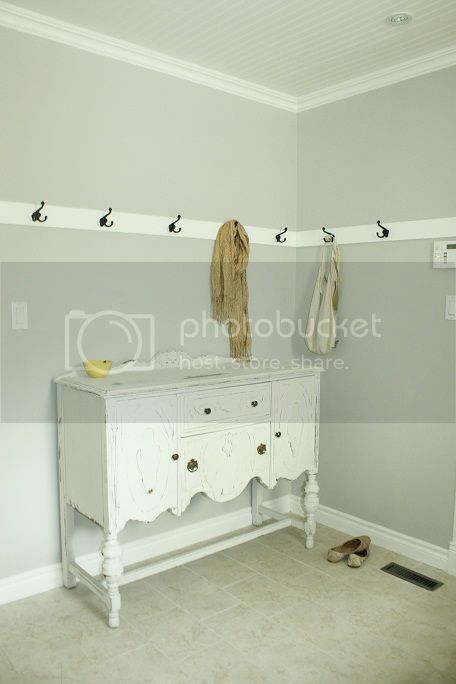 The hooks would be really cute, and I love a patterned rug idea! The hooks are a really good idea. Can't wait to see how your room turns out. 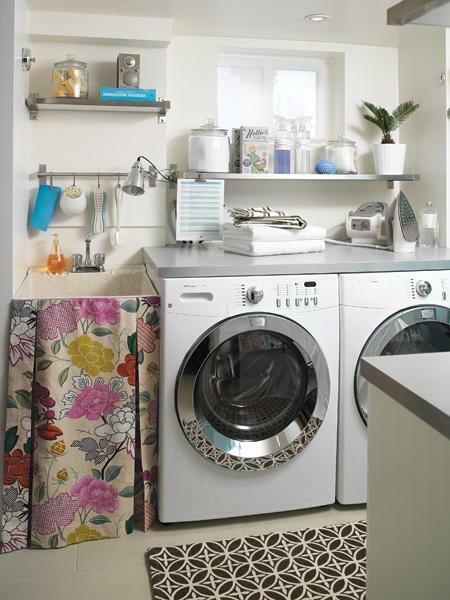 I love all the different ideas for the laundry room! The cover around the plastic sink is my favorite! 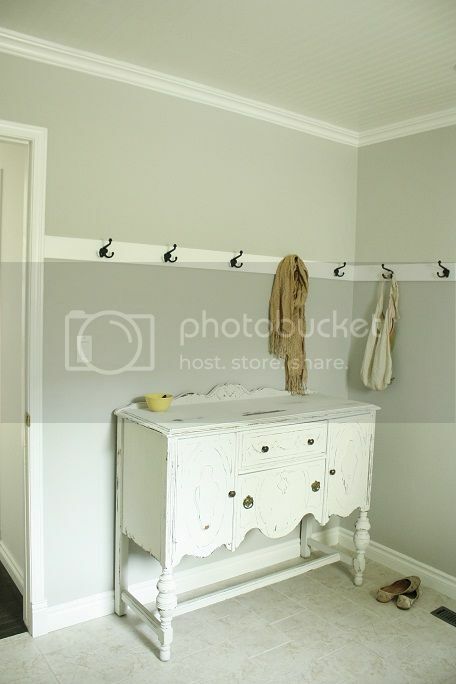 I have one in my laundry room and I hate how ugly it looks, I am definitely going to try it. Love all the ideas! I see myself spending a lot of time on your blog.